Lightning Returns: Final Fantasy XIII original Lightning. 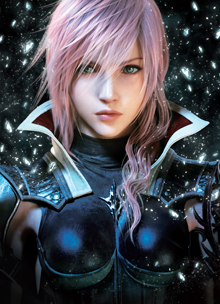 With the excitement surrounding Square Enix’s release of Lightning Returns: Final Fantasy XIII for Xbox 360 and PlayStation 3, the creative denizens of the DeviantArt community outdid themselves in a unique contest to create their own version of Lightning, the main character of this role-playing adventure game. Tetsuya Nomura, the principal character designer for Final Fantasy and the Kingdom Hearts series, was the special judge for this contest and today announced DeviantArt prizewinners, Randis Albion, Marga Donaire, and Nicolas Barge from a total of 4655 entries. “There were so many well-drawn pieces, that it was very difficult to pick just three. I was blown away by the overall level of quality,” Nomura said. This contest marks a first for Square Enix, which has never before participated in a user generated content program. Prizes include an original sketch from Final Fantasy character designer Tetsuya Nomura, a custom Xbox 360 console & controller, $1,000 cash, among others. Each winner is also featured at the top of deviantArt’s homepage for a full day. Check out the complete submission gallery.